Astronomers have made a 42-day movie showing unprecedented detail of the inner workings of a strange star system that has puzzled scientists for more than two decades. Their work is providing new insights that are changing scientists' understanding of the enigmatic stellar pairs known as microquasars. End to end is some 200 billion miles. "This once-a-day series of exquisitely-detailed images is the best look anyone has ever had at a microquasar, and already has made us change our thinking about how these things work," said Amy Mioduszewski, of the National Radio Astronomy Observatory (NRAO), in Socorro, New Mexico. The astronomers used the National Science Foundation's Very Long Baseline Array (VLBA), a system of radio telescopes stretching from Hawaii to the Caribbean, to follow daily changes in a binary-star system called SS 433, some 15,000 light-years from Earth in the constellation Aquila. Mioduszewski worked with Michael Rupen, Greg Taylor and Craig Walker, all of NRAO. They reported their findings to the American Astronomical Society's meeting in Atlanta, Georgia. SS 433 consists of a neutron star or black hole orbited by a "normal" companion star. The powerful gravity of the neutron star or black hole is drawing material from the stellar wind of its companion into an accretion disk of material tightly circling the dense, central object prior to being pulled onto that object. This disk propels jets of subatomic particles outward from its poles. In SS 433, the particles in the jets move at 26 percent of the speed of light; in other microquasars, the jet material moves at 90-95 percent of light speed. The disk in SS 433 wobbles like a child's top, causing its jets to move in a circle every 164 days. By imaging SS 433 daily, the astronomers were able to trace individual ejections of material in these jets as they moved outward from the center. 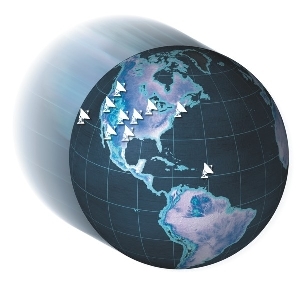 In addition, they could track the jets' precession, the movement caused by the disk's wobble. 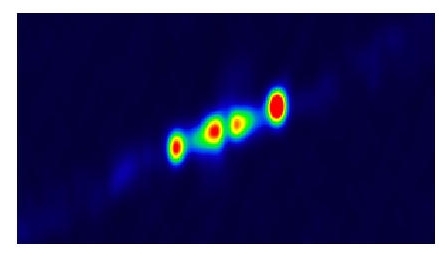 In other microquasars, blobs of material shot from the core become fainter, as seen with radio telescopes, as they move outward. However, in SS 433, blobs routinely brighten at specific distances from the core. From earlier studies, researchers had concluded that such brightening always occurs at one specific distance. The VLBA movie shows, instead, that there are multiple brightening regions and not all blobs brighten at all the regions. "We think the ejected material brightens because it's slamming into something," Rupen said. "However, whatever it's hitting has to be replenished somehow so that the brightening can occur again when the jet sweeps through that area the next time," he added. "It also appears that it isn't always replenished, because the brightening doesn't always happen," Mioduszewski pointed out. The VLBA movie revealed vital new information about another part of SS 433 -- material moving outward from the core, but not part of the superfast jets. This material moves outward in a direction not quite perpendicular to the direction of the jets. Discovered with the VLBA in 2000, this material had been seen only in one-time snapshots before, but the movie shows the steady evolution of its movement for the first time. That motion was the key to a possible answer to two riddles -- the source of the slower-moving material itself and the source of whatever the jet blobs are hitting when they brighten. "What seems most plausible to us is that the accretion disk is putting out a broad wind," Rupen explained. That broad wind from the disk hits a denser wind coming from the "normal" companion star to generate the radio waves seen coming from the nonjet region. The same disk-generated wind could be the source of the material that replenishes the regions where the jet blobs brighten, the researchers say. "The motion we measure for this slower-moving material is fast enough -- about 10,000 kilometers per second -- to put new material in a brightening region before the jet circles around to that spot again," Mioduszewski said. Because accretion disks like that around the dense central star of SS 433 are known to be unstable, any wind put out by such a disk could vary, putting out symmetric chunks in opposite directions. This, the scientists think, may explain why the jet brightening regions don't always get replenished with the material needed to cause brightening. 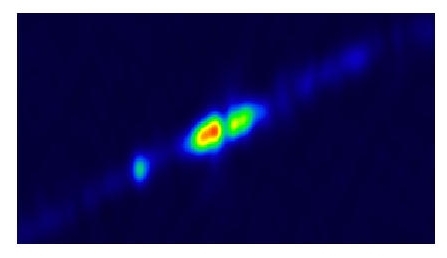 "We still have more questions than answers about this microquasar, but the VLBA movie shows us that following the system on a daily basis with such greatly-detailed images is the most powerful tool available so far to understand these phenomena," Rupen said. The astronomers now hope to follow SS 433 with the VLBA for an entire, 164-day cycle of the jet wobble. At the same time, they would like to observe the object with visible-light telescopes, then follow up with larger- scale images using the NSF's Very Large Array (VLA) radio telescope. 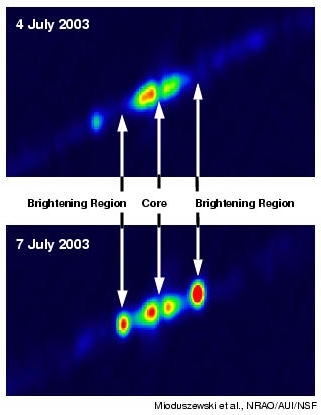 The VLA images would trace blob motions in the jets beyond the distances traced with the VLBA. SS 433 was first noted in the 1960s by astronomers Bruce Stephenson and Nicholas Sanduleak, who included it in a catalog they published of stars with unusual features in their spectra. As the 433rd object in Stephenson and Sanduleak's catalog, it became known as SS 433. In 1978, David Clark and Paul Murdin identified SS 433 as the visible-light counterpart of a small object that had been found to be emitting both radio waves and X-rays. The small object also sat within a large supernova remnant called W50. Clark and Murdin, using the Anglo-Australian Telescope in Australia, also produced a spectrum of SS 433 that showed strange features. In addition, the object not only varied in its brightness, but features within the spectrum changed. By 1979, further research, including work by Bruce Margon and George Abell, had shown that SS 433 was producing jets of material moving in opposite directions. The strange stellar system received a wealth of media coverage, dubbed "the star that is both coming and going" in one story. A 1981 Sky & Telescope article was entitled, "SS433 -- Enigma of the Century." The late Robert Hjellming of NRAO spearheaded studies of motions within the radio-emitting jets of SS 433 in the early 1980s. SS 433 was the first example of what are now termed microquasars, binary systems with either a neutron star or black hole orbited by another star, and emitting jets of material at high speeds. With the VLA's discovery of jets moving at 92 percent of the speed of light in an object called GRS 1915+105 in 1994, such systems became known as microquasars. Several others have since been discovered and studied. The VLBA is operated from the NRAO's Array Operations Center in Socorro, NM.